Not matter what box you check for yourself or your child; you are raising a multi-cultural child. In my home this is particularly true because my husband and I come from different cultural backgrounds and have both been exposed to many different cultures that influence our home life. We each speak more than 1 language, we eat a variety of foods from different cultures, we listen to a variety of music, and we attend events that are representative of our varying cultural perspectives. My husband and I should not be the exception in how we expose our child to the world. You cannot escape the fact that the U.S. is a diverse place and in order to live you need to be aware of and comfortable with difference. Statistics show that by 2020 the majority of the U.S. will no longer be Caucasian. I teach in two fields that use the demographic information of the country and I use this information in my courses often. I think we have already arrived at a society in which the people with “brown faces” have outnumbered the people with “white faces.” Being aware of and able to work side-by-side with and live with people of a variety of cultures is no longer optional. I haven’t had the pleasure of visiting every state in the union, so I’m sure there are some places where you can go and still have a homogeneous experience. But if you want your child to be mobile, have options, be successful, and not be isolated then you need to be raising a multi-cultural child. K-12 schools are more diverse (as are the snacks & lunches kids bring with them); diverse school lead to diverse college campuses; which leads to a diverse work-force – at least 50% of current jobs ask if you are bi-lingual (usually this is code for Spanish, but knowing another language other than English is helpful). So…along with reciting the ABCs, counting, teaching hand-washing, stranger-danger, and ALL of those other big & small lessons we teach…we should be exposing our children as often as possible to other cultures. And not just in passing or as a tourist attraction type of thing – as a fact of our daily lives. Role model acceptance and awareness. Diversity is not scary it is beautiful and it is our reality! P.S. 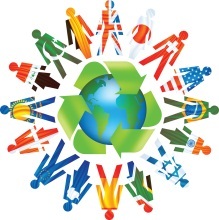 In my world multiculturalism and diversity goes beyond race and ethnicity, but I know that for many people exploring different racial groups and ethnicity is a start. But int he true sense of diversity we include ability, gender, religion, sexual orientation, etc.